The SMU Mustangs are a lifetime 57-3 in Moody Coliseum, but for a while at least, the Privateers (2-6) gave them a run for their money before falling 79-66 on Wednesday night. New Orleans, which trailed 44-34 at halftime, had the deficit down to 61-56 at the under-12 timeout before the Mustangs stepped up their defensive pressure and the Bucs' scoring pace slowed considerably. UNO got a rare spark from long distance, as Bryson Robinson drained four threes and Ezekiel Charles three. SMU, though, one-upped them in this department, connecting on 11 shots from downtown (11-for-22). 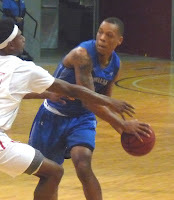 Robinson led the Privateers with 16 points in addition to 6 rebounds and 5 assists. Travin Thibodeaux had 15, and Charles added 14, all in the second half. UNO will head to the Cajundome on Saturday night to take on former Sun Belt rival Louisiana-Lafayette.